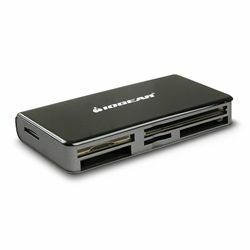 Up to 10 times faster than USB 2.0 card readers, IOGEAR's portable multi-card reader/writer is equipped with the SuperSpeed USB 3.0 and can read 59 memory card formats. Each of the six slots boots independently, so you can use multiple cards at once. Includes USB 3.0 cable. Requires Microsoft Windows XP+ or Mac OS (does not support USB 3.0 on Mac OS).